SIZE (8"x10") These bags are great for mailing of invoices, imp papers, cheques, DVD’s, CD's, brochures, samples, garments, online shopping, leaflets, etc. They are manufactured with flap, which has a hot melt pressure sensitive adhesive strip for easy permanent closure. Once sealed properly, it cannot be opened has to be torn. · These bags are great for mailing of invoices, imp papers, cheques, DVD’s, CD's, brochures, samples, garments, online shopping, leaflets, etc. · They are manufactured with flap, which has a hot melt pressure sensitive adhesive strip for easy permanent closure. · Once sealed properly, it cannot be opened has to be torn..
· Milky White Colour outside Gray/black inside polyethylene. · Recommended for confidential mailing. 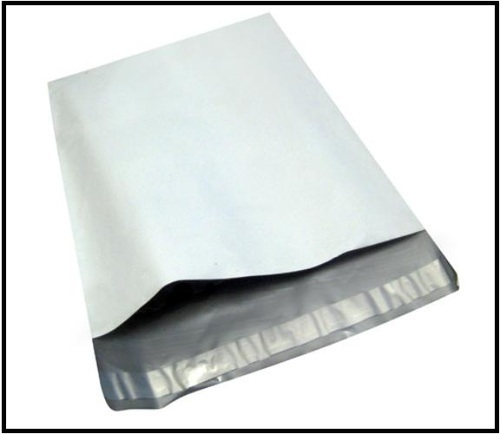 · Hot melt adhesive strip on the top which ensures that parcels once sealed cannot be removed from the bag without tearing the envelope. · Easy to write on with a permanent marker Co-Extruded 3 layer film. Backed by a considerable industry experience, we are engaged in manufacturing, exporting and supplying all kinds of packaging machines to our customers across India. Our extensive range of packaging machines includes Packing Line, Auto Strapping Machine, Shrink Packing Machine, Sleeve Sealer, Automatic Band Sealer, PCS Plastic Film Sealer and Automatic Vacuum Packager. Additionally, we also provide Semi-Automatic Carton Sealer, Pallet Stretch Wrapping Machine, Automatic Three Dimension Packing Machine, Automatic Cup Fill-Seal Machine and Granule Packing Machine. Furthermore, owing to our in-depth understanding of the working of this domain we are able to offer Pad Printing Machine, The Production Line of Washing, Filling and Capping Machine, as Series Automatic Liquid Packer, Automatic Milk Bottles Filling and Sealing Machine, DGYF Series Portable Induction Sealer, JMS Series Split-Body Colloid Grinder, Blister Sealing Machine and Semi-Automatic Tridimensional Packing Machine. Being a reputed supplier, our aim is to maintain the international quality standards of our products. We supply products which are well tested and verified before dispatching them at clients’ address. Appreciation of our clients has enabled us to form a loyal client base. Over the years, we have managed to carve a niche in domestic markets and are looking forward to further expand our business.